Agenda 2030 comprises 17 SDGs with 169 targets. In the Sustainable Development Goals (SDGs) lies the solution to Pakistan’s three central challenges: development, democracy and defence. That said, the SDGs will provide the glue that holds this fragile triangle. Implementing the UN’s 2030 Agenda for sustainable development, if realised as an integrated policy package, will also lead to long-term economic prosperity, human and environmental development. However, aside from external threats, a poor score card on meeting the 17 SDGs and the 169 targets specified by the UN will pose a serious, non-traditional threat to the country’s national security. That said, it is time to address what could turn out to be more like 17 socio-economic risks to Pakistan’s security and progress, if targets remain unmet, especially those related to poverty alleviation, gender empowerment and climate change adaption. The SDGs cut across all areas of government – from health and education to ending poverty and achieving gender equality, through to tackling climate change and utilising natural resources sustainably. The objectives underpin good governance and integrate three dimensions of sustainable development – economic development, social inclusion, and environmental sustainability. These are ambitious and complex goals requiring clearly mandated institutions and unflinching commitment to provide resources from the national exchequer for a decade and half. And this implies commitment that is as strong as that for acquiring nuclear technology. Present and future civilian and military leaderships will need to follow through on this commitment. If these goals and targets are too many for the country’s present resource capacity, then Pakistan can still decide to pick half, or even one-third, during this initial phase. While learning how to deliver sector-based integrated targets and indicators, the government can expand its ambition. There is no international obligation to sign off on all goals, targets or indicators. Government ambition has to be measured against its ability to carry out policy and institutional reforms. Most national and provincial policies and action plans are developed in silos and are not backed by financial resources, timelines or strong political will. Provinces will, therefore, need to champion and drive the process of localising and prioritisation. If the history of vertical projects is an indicator, leaving it to federal level decision-makers will be risky and too top down for the present political culture. Therefore, the federal government should provide added support for certain specific SDGs via the National Finance Commission awards for these goals to be reliably anchored in provincial annual development plans. Fortunately, the Planning Commission has begun to engage provincial and development departments (P&DDs) that would serve as nodes leading to the formation of special units or SDG centers. Other provinces can learn from Sindh, where Chief Minister Murad Ali Shah’s government has taken the lead in working on these development goals. But more important is working on the sustained capacity-building of those tasked with initiating and implementing actual work on approved development projects. The bottom line is clear: every rupee spent on SDGs in public expenditure needs to be tracked through a uniform and transparent budget coding system, and individual projects within provincial annual development programs must be measured against SDG indicators. This will provide a rare opportunity to improve interprovincial coordination in development plans where the policy landscape needs to be SDG compliant. If these goals and targets are too many for the country’s present resource capacity, then Pakistan can still decide to pick half, or even one-third, during this initial phase. Additionally, political parties must work to mainstream sustainable development within national discourse. Their manifestos might highlight social and economic issues, but ensuring they are SDG compliant would shape the electoral debate to specificities rather than broad rhetorical pledges. National and provincial assemblies can also lead this process; particularly since the federal government has already created a non-partisan parliamentary taskforce comprising national and provincial parliamentarians, and have allocated funds. This taskforce should work with think-tanks and the Pakistan Institute of Parliamentary Services. This, in turn, will prompt the media and their political pundits to follow almost immediately. To add, Pakistan is needlessly struck with an archaic method of budgetary planning. Over the years, the state has developed a notoriously weak reputation when developing, implementing or monitoring social sector projects, resulting in globally dismal and embarrassingly poor indicators. That the SDGs will provide an opportunity to revisit the way the government approaches and undertakes development is something to be explored. Meanwhile, federal and provincial governments need to determine governance structures and accountability mechanisms required at national and local levels. This must not be sidestepped. Likewise, the P&DDs will need to formulate six prerequisites for successfully implementing the SDGs: governance and oversight, goal and indicator setting, implementation mechanisms, coordination, developing budgets and, finally, allocating resources. Going forward, new models of public-private partnership need to be tested. Policymakers should begin by proactively engaging the private sector, research universities, think-tanks and civil society, including professional associations. The SDGs are perhaps the best vehicle to lift more than 50 million people out of poverty when they earn less than two dollars a day by enriching their lives and livelihood options. Delivering on these goals will also help enhance Pakistan’s ability to emerge as one of the world’s leading economies and, while doing so, strengthen national security. Continue reading Dawn’s special coverage of the SDGs by clicking the tabs below. Ending poverty: A real opportunity for change? The first Sustainable Development Goal (SDG) is dramatic in its objective to “end poverty in all its forms everywhere” by 2030. The question is whether this goal is even a logical possibility, given the Millennium Development Goals (MDGs) – though narrower in scope – sought to do the same and were said to be the ‘most successful anti-poverty movement in history’. And have learned economic philosophers not pondered over the relative nature of poverty – that no matter how well off everyone is, some will be poorer, and poverty is about those who are poorer. Perhaps because wanting to end poverty is so fantastic, it has been helpfully broken down into more tractable targets: ensure that no one lives on less than US$1.25 a day. This idea owes its origins to a debate about global poverty lines – or levels of income below which a person is considered to be poor. And if the $1.25 a day target seems too rigid, then there is the more achievable goal to “reduce by half the proportion of men, women and children of all ages living in poverty in all its dimensions according to national definitions.” This gives quite a bit of leeway to national governments to come up with their own definitions of poverty reduction and then implement methods to achieve such objectives. Furthermore, deserving attention are the other less easily verifiable sub-goals relating to the process of ending poverty: implementing social protection systems for all, ensuring equal rights to economic resources and building the resilience of the poor to climate change events. Most governments can say that they are already moving in this direction. In the case of Pakistan, the state can point to the Benazir Income Support Programme (BISP) as its social protection system, claim that its Constitution guarantees equal rights to economic resources, and wait for the next climate change event to happen before doing much about building resilience while it launches an appeal for funds. The point being, that while SDG 1 may outline targets with the ambitious objective of ending poverty, it concludes realistically with a whimper about conditions, such as the mobilisation of resources and building sound policy frameworks – many of which are virtually impossible to monitor. The belief that the government tries to mobilise resources and works on sound policy frameworks is widespread, but actionable evidence to this effect is nonexistent. During the MDGs, the number of people living in extreme poverty increased in 30 countries. The goal to end poverty is, therefore, a mixed bag of the virtually unachievable and the already done. The research group, Development Initiatives has noted that the goal of ending poverty by 2030 will prove more challenging that halving poverty globally. It has warned that where poverty is the deepest, governments lack revenue needed to turn the SDGs into a reality. Then, why does the UN system produce such unachievable goals, and why do governments sign up to them? Once the UN system had adopted the MDGs with such fanfare, as a showcase of a global social contract, it really had to come up with a follow-up act. Cynical as it sounds, if poverty reduction in Pakistan is the goal, much good might be extracted from this box of magic tricks. Since the government has signed up to SDG 1, they can be asked to adopt the equivalent of US$1.25 per person a day as an official poverty line. This can put an end to the paralysing debate about the new poverty line – a debate that has raged since 2001 when the last line was set. The SDGs can also be used to push for a quick consensus on ways of measuring “poverty in all its dimensions according to national definitions”. To add, there is a solid argument for mainstreaming these indicators into national policies and plans since the government has signed up to the SDGs. There is also much that can be done with process-related goals in SDG 1. Any weakening of political commitment to the BISP (or a large scale cash transfer programme) can now be confronted with the argument that the government has willingly signed up to expand, not reduce, social protection. The commitment to equal rights to economic resources provides the basis for the most sophisticated demand-making on the part of those who argue for a more political understanding of poverty reduction. How do you ensure equal rights to economic resources in a highly unequal society where the economic system is based on private property rights, and where publicly-owned economic resources are mostly doled out to various elites? By highlighting and talking about these very contradictions. Yes, signing up to equal rights to economic resources creates the possibility of arguing once again for land reforms, despite what the courts have said about them. It also opens the window to demand the repeal of discriminatory laws and legal practices which exist despite our Constitution – laws such as the Punjab Land Alienation Act and practices such as benami holdings. The former divides the rural society of the largest province into higher status agricultural tribes and lower status non-agricultural tribes whose economic rights are circumscribed. The latter (benami) is often used to limit women’s rights to property. These are examples of laws and conventions across Pakistan in favour of incumbent property owners over non-propertied classes. Then, there is the potentially explosive but possibly negotiable issue of rights to natural resources – most happen to be located in the poorest and most politically alienated regions of the country. The SDGs were borne out of politics and their best use in countries such as Pakistan is political – to create the space for legal, political and policy changes that will lead to poverty reduction. The dramatic promise of SDG 1 can quite easily fade into a whimper, but it also gives the committed campaigner a peg for asking difficult questions. Make of it what you will. It was a late evening in Islamabad, a few months after the 2005 earthquake, when I spotted an old man standing by a road. I pulled up beside him, assuming he needed a ride. When I asked if I could take him somewhere, he pulled a young boy from behind him to his side and said, “If you want to help, take him with you and give him a decent life. This is my grandson and I cannot feed him anymore. His parents are no more and I am too old to work. And I cannot see him hungry.” A decade later, I still get teary-eyed when recalling this moment. One would want to believe, as popular myth goes, that people do not go to bed hungry in Pakistan. In 2016, Pakistan ranks 79th out of 109 countries according to the Global Food Security Index. Approximately 40pc of children under the age of five are underweight according to a World Health Organisation (WHO) survey. Iodine, iron and protein deficiencies result in an annual loss of 3 to 4pc of the GDP. And with millions of children compelled to attend schools hungry, the situation couldn’t get worse. It is impossible for a hungry child to focus on learning when adequate nutrition is needed for optimal mental and physical development. 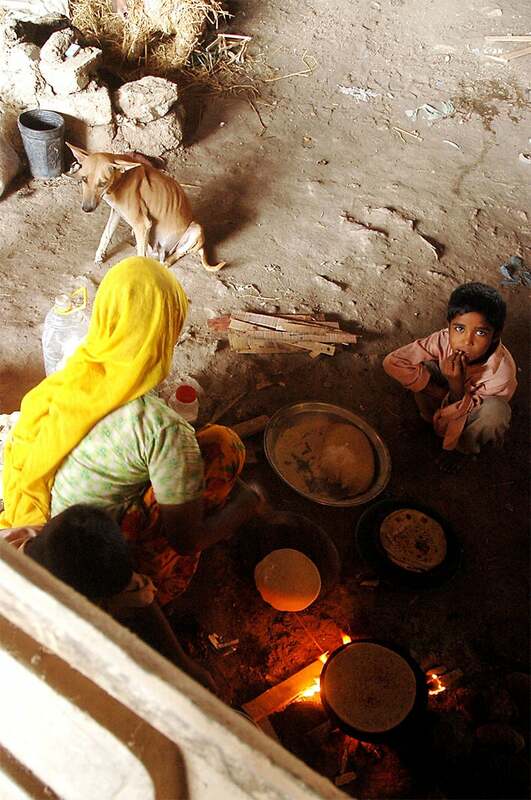 The UN Food and Agriculture Organisation (FAO) estimates 37.5mn people in Pakistan are not adequately nourished. To add, an estimated 45pc of deaths in children under the age of five are caused by poor nutrition. If pregnant and lactating women are malnourished and if children do not get adequate nutrition in the first few years of their life, mental and physical deficiencies become endemic. The Food and Agricultural Organisation (FAO) of the UN defines hunger as the daily consumption of fewer than 1,800 kcal by an individual. 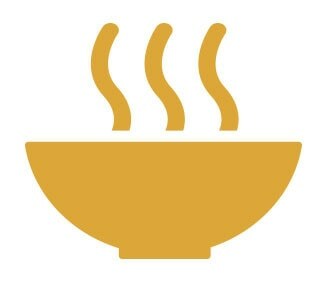 Adequate nutrition is a basic right as Goal 2 of the Sustainable Development Goals (SDGs) relates to ending hunger, achieving food security and improving nutrition with the objective to promote sustainable agriculture. 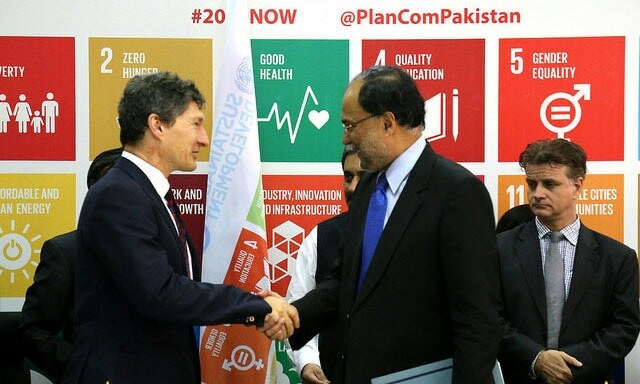 By 2030, Pakistan is supposed to “end hunger and ensure access for all, especially for the poor and vulnerable, to nutritious and sufficient food the year round.” By signing on the SDGs, the government has committed to ending all forms of malnutrition. However, independent of these commitments, if the country wants to achieve high growth rates and sustain the latter to ensure development, hunger and food insecurity need to end. The tragedy is that it is not the case that Pakistan is not producing enough food. It can easily afford to provide adequate nutrition for all citizens. It is a question about asymmetric income and wealth distribution which, in turn, results in iniquitous access to food. Poverty is one reason for insufficient access – the vast majority of the world’s hungry people live in developing countriess where 12.9pc of the population is undernourished. 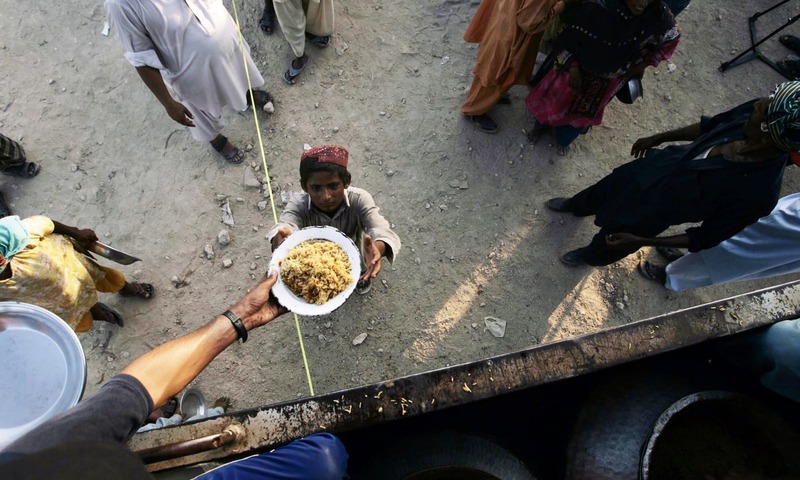 Overall economic deprivation is the reason for a certain percentage of people with poor nourishment in Pakistan. However, by almost all measures of poverty, the latter has decreased significantly over the last three decades. Nonetheless, at the same time, food insecurity still remains high, thereby stagnating maternal and infant mortality rates. About 50pc of women and children under the age of five are malnourished, according to WFP. It is incomprehensible, then, that larger numbers of adults are malnourished and choose to keep their children poorly nourished even when poverty has decreased over the past few decades. The reason is a lack of investment in public services, such as access to portable water, sanitation, public, and preventive and curative healthcare. Wealthier segments of society have access to better quality, privately provided social services whereas the underprivileged and vulnerable rely on the state’s provision of public services. So, even if ‘poor’ families – from low-to-middle-income segments – have an income above a minimum threshold, they stile have access only to poor quality drinking water, limited access to quality liquid and solid waste management services, and no decent healthcare services – implying poor health outcomes. An unhealthy individual is likely to have reduced nutrition absorption as well. Another factor imperative to ending hunger is climate and environmental changes, predicted to play havoc with future agricultural output. If, with adequate food availability and a fairly robust agricultural sector, the country is presently beset with severe malnutrition challenges – almost 60pc of Pakistanis are food insecure – what is the possibility for a future with acute food and water shortages? Agriculture also supplies a large percentage of jobs and income opportunities in rural areas. If it becomes more unpredictable, such shifts are likely to impact job and income opportunities. If increased inequalities remain unchecked and there is minimal investment in public services, then it is hard to imagine how the government will even come close to its target of eliminating hunger and ensuring access to adequate nourishment for all by 2030. Current inequality trends are, in fact, detrimental to eliminating hunger. To add, if climate change is even half as disruptive as predicted, then ensuring adequate nutrition will become more elusive. Reorienting policies to include greater social sector investment in health, education, water, sanitation, employment and income guarantees, and food and nutrition programmes in schools are required urgently. Despite the adverse socio-economic impact of poor development policies, social sector development – especially mandated to the provinces under the 18th Amendment – is not even under discussion at policy tables in Pakistan today. Well they probably failed almost all the targets. Lets see : Lower dependence in fossil fuels but they just invested in coal mine and coal power plant in Thar. Second, education budget was lowered thanks to our leaders who thinks Pakistanis don't require education. Third, health institutions are crumbling and there's zero support by the government. So I really hope that in the next 15 years we really come out of our world where we are fighting among our selves for being different in faith, culture, etc. and perhaps work together for a better Pakistan. Investment in education today will reap benefits after 25 years so the sooner we do it the better it is. I don't think any western country is good example of sustainable development. The best example in sustainable development is none other than little BHUTAN. All the resources available for construction and other things are limited. Instead of misunderstanding development with high rise buildings or express highways, we should find out more efficient way of using limited resources. Now, this is something Pakistan should be doing instead of looking for strategic depth in other countries. Present figures are horrible.. I wish best of luck, get any help required from India to achieve this goal. It's all useless. Practice is to present SDGs as part of your manifesto prior to elections and implement during your tenure as part of commitment. If you make SDGs at the end of your term, what is the point then? Focusing entire attention on education,elimination of poverty and infrastructure is the solution. India is following the same path. Even a failure on the right path is a success. Keep going and all the best. Purposes and objectives of the Document can be game changer for this subcontinent.Poverty-eradication,gender equality in a patriarchy mindsets and universal access to health care and education in our environment must be supported wholeheartedly.It is high time this subcontinent also catches up with the advanced world in terms of living standards of a modern and decent life.Shukria. @vinit very well said Vinit! The UN publication, "Earth Summit: Agenda 21," outlines every area of regulation including industry, science and technology, farming, the role of children, youth and women in sustainability, water, poverty along with demographic dynamics and human settlement development. Concerned citizens believe this framework has nothing to do with environmentalism and everything to do with control of a nation's resources. Massive swathes of 'public land' will be under the command of the government who are then controlled by the policy of the UN. Many are troubled that the agenda is created by a global organisation yet spoon-fed to the public under the auspice of "local" government. If this doesn't sound alarming enough, what does? ...It might be worthwhile to consider the ramifications of Agenda 21. Does the public truly desire regulation by a behemoth world organisation or would citizens rather find solutions within the freedom of authentic, local innovation and small government? Sincerely and patriotism is the key to achieve these very important goals. Corruption must end. @Pakistancomesfirst We're doing far better than you and the world knows it. I still remember the much touted Millennium Development Goals by 2015 of the same person, during the last innings of the N-Governance! Of all the national priorities, building of human infrastructure is the most important. The first building block of this is education. Education is of two types: one, universal child literacy so that they grow up to be rational, understanding individuals devoid of superstitious thinking and capable of arranging their life affairs on scientific lines. The second form of education is the higher learning which of course cannot be given to everyone but to selected citizens. Scientific thinking and discipline can be illustrated by one glaring example: Our population has increased 7 times since independence and all the physical development has always lagged far behind because the people do not have the sense to control their own population as they are the only ones who can do so. I am sorry to say that though everything said in the above article is excellent, it is unlikely to go according to plan. I would venture to offer that targets were set under each successive governments since the founding of the nation; source of funding and logistics were being worked on; risks were being recognized and mitigated. And yet, the goals remained unmet, a pipe dream for one fundamental reason: corruption and greed. The projects that were viable and sustainable could not get off the ground due to mismanagement, politics, incompetence and instability. The only time Pakistan has had some measure of stability and measured growth was during Ayub Khan and Pervaiz Musharraf regimes - both military men. They could not last and complete their mission of development and growth due to dirty politics and subversion in the institutions which were corrupt to start with. The opportunity that was lost is breeding the fundamentalism and extremism, as a direct result of poor educational system and poverty. Pakistan is growing now with good pace with good project like CPEC, LNG & Power which will improve our infrastructure. Being pakistani we shall devote our time to educate poor for free and doctors shall try to provide free consultation to poor. People shall share mosques as place of free education during time when there is no prayer time. Pakistani government shall provide places for sports to cut down physical and mental diseases. Promote people to grow their own food on house roof top free area and allow people to use milk from house managed cows like people do in the past. @Farhan Mahboob Really??? "use milk from house managed cows like people do in the past" You want to go back to the past, instead of moving to the future? How many households in Pakistan even now, own their 'cows'? I think you are living in the 1800s! The author's optimism is healthy but misplaced that 'reforms' are the answer to mass hunger, malnutrition, illiteracy, ... rather than structural transformation. The modest beginning is to stop doing bad things that accelerate the SDG goals in reverse! The author knows these well, and most readers will too. Hence the best advice to the state and ourselves is stop doing the blatantly, cruelly, obvious things that deepen poverty, extend degradation of ecosystems, expand inequality. How about cancelling all coal projects for a start? Readers may benefit from reading critical analyses, such as those shared in the facebook site ECOSOCIALISM.